National Police Commissioner Khehla Sitole last week paraded a considerable win for his men and women in blue – the bust of a "house on steroids", a large drug manufacturing lab on a plot in Hammanskraal. The cops made several arrests, recovered weapons and seized products used to manufacture narcotics. Sitole was clear that the bust was the result of an intelligence-driven operation. On Wednesday this week, police acting on a tip off foiled an attempted robbery at a petrol station near Melrose Arch in Johannesburg. They were lying in wait as five men pulled into the BP on Corlett Drive, intent on holding up the PnP shop. A shootout ensued and all five ended up in custody – the result of good, solid intelligence. Last week, a Serbian man with known links to organised crime in that country, was shot dead in a hit in Roodepoort. This was at least the fifth targeted killing in Johannesburg in the last year linked to Eastern European criminal syndicates and thus far there have been no arrests, no indications of motives and no breakthroughs. These dangerous criminals have been allowed to conduct their deadly business in broad daylight with no repercussions whatsoever. This begs the question, how good is our police intelligence really, in light of a decade of gross abuse, negligence and capture? Earlier this month, the Presidency released a bombshell report by a high-level review panel into the State Security Agency (SSA), revealing damning evidence of how the SSA was repurposed to serve the political interests of former president Jacob Zuma and his cronies within the ANC. The panel, headed by Dr Sydney Mufamadi, drew on reams of documents and interviews with former and current ministers, staff and operatives to conduct its review. The results were bleak, describing how there was widespread abuse of funds, blatant disregard of legislation, unlawful spying on unions, civil society organisations and Cabinet ministers and even blatant criminality. No formal, independent review like this has been done on the SAPS Crime Intelligence unit but it is no secret to the public that over the last decade there has been looting and capture and very little actual crime-fighting and intelligence work has been done. Much of this came out in 2013 and 2014 when allegations first emerged that then head of Crime Intelligence, General Richard Mdluli, and top officials Solly Lazarus and Heine Barnard were plundering the secret slush fund. Mdluli was on suspension for eight years during which he earned over R12m (including a performance bonus) for sitting at home. A series of acting heads were brought in, all of which left disgraced by one scandal or another. That was until last year when Peter Jacobs, a former uMkhonto weSizwe (MK) soldier and intelligence operative, was brought in to try and right the ship. This week marks exactly a year since Lieutenant General Jacobs was appointed and an appropriate time to reflect on the status of the SAPS Crime Intelligence unit. Addressing Parliament's Portfolio Committee on Police earlier this month, Sitole said that the Crime Intelligence unit has been "affected" by revelations in the SSA report but is "not captured". "Some findings of that report affect how intelligence should operate in the police," Sitole explained. "Generally, chair, I can say the findings of that commission are aligned to our strategy." He said there would be an "immediate impact" on Crime Intelligence should the SSA not be functioning as it should. Jacobs said the panel didn't cover the unit's work, but he was called before the panel and provided his input. He also explained that Crime Intelligence had done an internal audit of the situation there. "Last year, we did a full, robust review of Crime Intelligence," he said. "It was fairly intense, the issues we identified." He said the unit was dealing with instances where there had been overreach, including several cases in which officials were charged in disciplinary proceedings. He said disciplinary proceedings were slow and explained that while the sheer volume of charges against officials might leave some with the impression that certain people were being targeted, the sole reason was to turn the organisation around. Jacobs received a fairly positive response from MPs who seemed to be heartened by the improvements within the unit. DA MP Dianne Kohler Barnard even suggested that Jacobs seemed to be "working miracles". However, when speaking to those deep inside the organisation, the picture is far more ominous. Over the past three months, News24 has met and interviewed several Crime Intelligence officers, off the record, to get a sense of the picture within. Several queries have also been submitted for official comment to SAPS spokespeople. These interviews illustrate an environment that is still crippled from years of infighting, where officers are hamstrung by shoddy technical resources and a lack of political will. The result is a compromised capacity to fight crime, particularly organised crime. "We're busy with internal squabbles and stabbing Jacobs in the back, instead of doing our work. Jacobs is being met with resistance from people who were supposed to support him," a senior operative divulged. "He wants production and to change the culture. He is trying really hard but is facing a revolt from previous heads of CI. It's all still bubbling. The situation is dire." As he describes it, Jacobs has spent the past year trying to work out those who have been obstructive and who benefited from previous capture and remain loyal to it. They are attempting to frustrate efforts to reform and rebuild. HR and disciplinary processes are slow and tedious. "These people are still sitting at home and drawing salaries. CI was not doing anything for eight years and the wheels came off completely. Every person who was there, they came there to loot." While the SSA report described how agents and resources were used to unlawfully spy and tap calls, it isn't absolutely clear if that was indeed the case at Crime Intelligence over the same time period. There have long been rumours about this occurring but it has not been confirmed. Crucially, the informant networks and undercover projects also remain crippled, which is extremely concerning for cracking crime syndicates. "The informants are not being paid. We know that people are scared to talk as a result," says the Crime Intelligence insider. They also confirm that there is no undercover project into the Serbian assassinations or on any Eastern bloc presence in South Africa, leaving them to operate with impunity. Another Crime Intelligence agent says things are looking up though and there has been a vast improvement over the past year. "We are getting there," says the officer. In December last year, News24 revealed how a six-page grievance against Jacobs, authored by financial section head in Crime Intelligence, Brigadier Tiyani Hlungwani, had been submitted to police management. We explained how Jacobs was facing a standoff within his unit, which was resulting in the freezing of operations as informer rewards were not being paid, rent payments for safe houses were being withheld and funds for operations were not being released. At the centre of it is the criminal case involving Hlungwani, former Crime Intelligence head Major General Pat Mokushane and head of technical support, Brigadier Leonora Bamuza-Phetlhe. It is alleged that Bamuza-Phetlhe was paid R50 000 from the secret service account for catering at a meeting which was approved by Mokushane. This was done after Hlungwani allegedly approached a colonel in the secret service to make payment into Bamuza-Phetlhe's personal bank account. However, it's alleged that the actual payment made to a company for catering services was R5 000 and that the accused wanted the money for their own benefit. Hlungwani confirmed that he submitted a grievance against Jacobs but would not comment further, saying he was not permitted to do so. Bamuza-Phetlhe said she was not involved in the lodging of the grievance in any way. In the grievance, Hlungwani complains about Jacobs' "autocratic management style", unfair discrimination, racism, perjury, defeating the ends of justice and maladministration. Hlungwani alleges that Jacobs, a former MK soldier with a well-documented record of fighting the apartheid government, is racist. Jacobs is also accused of failing to take steps against senior managers and other employees who committed criminal offences, and of failing to report crimes in terms of the Corruption Act. Hlungwani gave examples of how a major general and a lieutenant colonel used secret services account funds to book accommodation and submit fraudulent claims and used a safe house as their place of residence without authority at exorbitant rentals. Another colonel was apparently paid an amount of R160 000 for rentals of his own house after colluding with other officials to rent his house to Crime Intelligence as a safe house without disclosing the conflict of interest. He complained that the incidents were never reported for investigation. At the time, the police did not officially confirm that a grievance was lodged against Jacobs, but spokesperson Brigadier Vish Naidoo said "the mere fact that a member is able to lodge a grievance against the head of a division, is a confirmation that members have avenues for recourse". He did not respond to detailed questions. "Given the sensitive nature of the work done by the environment your query is based on, I am not going to respond in detail to these matters as they are operational in nature. However, I think you are aware that the Crime Intelligence environment has been without a permanent head for up to seven years and it was an environment that was marred by one controversy after another during that period. Since the appointment of Lieutenant General Jacobs as the head of Crime Intelligence a few months ago, a turnaround strategy was adopted. We can confidently say that the Crime Intelligence environment is now operating with greater effect than during the tumultuous period I have alluded to earlier," said Naidoo. It's understood that this fight between Bamuza-Phetlhe and Hlungwane and their bosses at Crime Intelligence is the main battleground for the pushback against Jacobs. "We are getting there. It's just the likes of Phetlhe and her gang that cause discord," one senior officer explained. Speaking to News24 in December, Bamuza-Phetlhe insisted she was not untouchable and was not part of any kind of cabal attempting to oust Jacobs. She said she and Hlungwane were not part of a faction. She also doesn't understand why some MPs have labelled her as untouchable and says she just wants to do her work, which is to fight crime. "I am not untouchable but always stick to the truth. But I don't mind being called that because that and all other name-calling does not reduce me to nothing. I encourage General Jacobs to do his work with integrity and fairness and not listen to gossipers trying to derail him. I don't know where that's coming from. I don't have time to entertain such things and I don't care what they are calling me. As painful as it is for them to drag my name, I don't care. Crime is so high because they are just wasting time in Parliament talking about Phetlhe when they should be fighting crime. The truth will always prevail." Three months later this standoff is still bubbling and Jacobs is struggling to remove Bamuza-Phetlhe from her office. The disciplinary process is stalling, frustrating commanders. A 'grabber' is one of the most powerful devices available to intelligence organisations. Officially known as an IMSI-catcher, the phone signal grabber is used to conduct surveillance as part of police operations. Theoretically, it can intercept calls and locate devices through transmitted signals. In the SAPS, the operation of grabbers falls under the tracking and locating office within Crime Intelligence. News24 has been told that only three of the eleven owned by SAPS are currently operational and the work of these four is intermittent and unstable. The four that are working are in Gauteng, KwaZulu-Natal and in the Western Cape. These grabbers only work on the 2G and 3G "old technology" networks and insiders say it is an ongoing battle to keep them on 3G. This means they cannot intercept calls but can only locate devices. "We're able to work but not [at a level] where we should be. It's a very dire state at the moment," says an officer with knowledge of the state of affairs. Provincial commanders are fed up at the impact this is having on complex cases, particularly kidnappings. A 2017 bid to buy new grabbers for the police was urgently put on ice when it emerged that the procurement process was being hijacked, allegedly to finance votes at the ANC's elective conference in Nasrec. According to court papers, it emerged that the grabbers, which ordinarily retail for R7m on the open market, were to be purchased at the inflated price of R45m a piece and the excess funds were to be siphoned off for bribes. When Sitole heard about the Independent Police Investigative Directorate (IPID) investigation into the procurement process, he immediately stopped payment to the service provider, I-View. A more recent attempt by Jacobs to procure new grabbers from a different service provider is also believed to have been frozen. Several sources said that this is a result of the Hlungwane complaint. The chief financial officer has apparently asked Treasury not to approve the funding and the procurement has stalled. As a result, officers on the ground are hobbling along with crippled devices. There are also more complex factors affecting service delivery at grassroots level. The events at the Gauteng tracking and locating office over the past year are a microcosm of this. In April last year, almost the entire complement of officers in that section was "grounded". These included a lieutenant colonel, a captain, a warrant officer and four constables. They were informed that they would no longer be reporting to their unit commander, but rather to a Captain Miya, who was the acting section commander. On the instruction of the head of Crime Intelligence in Gauteng, General Kulele, the seven were taken off the grabber and told to remain in their office – they were not given reasons why. They were essentially sidelined. For more than eight months, these seven officers were paid their salaries in full while they did no work at all. They would report to their desks, with no tasks allocated for them to complete. A police issue Nissan Navara was used to collect them all for work from various residences in the morning, at a cost of R12 000 per month. Several of them lodged grievances against General Kulele with Jacobs, IPID and the Inspector General of Intelligence. 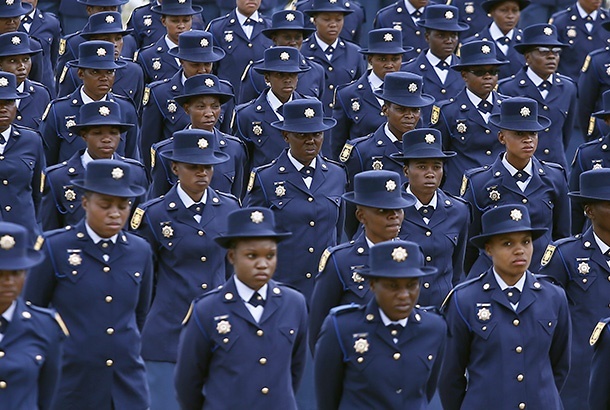 Most of them have been relocated within SAPS but two still remain "grounded" within the unit on full pay. Following a formal media query last year, police spokesperson Naidoo declined to comment in detail. "There is currently an HR process underway regarding the members in question. In view of this being an internal matter, we will not be providing details of this process. It will suffice to say that while this process is underway, service delivery is not compromised." Towards the end of last year, General Kulele was moved from his post as head of Crime Intelligence in Gauteng. Last month, News24 revealed how the police officer tipped to replace Kulele was being charged with obstructing the ends of justice after unlawfully instructing that a murder suspect be released from custody after she had allegedly killed her husband. Major General Auma Esther Korae, who was a cluster commander in Ekurhuleni, was charged following an IPID investigation. A brigadier has now been appointed as acting head. Meanwhile, Crime Intelligence in the Western Cape has been consumed with battles of a different kind. The province is the home of Crime Intelligence head Peter Jacobs and the skirmishes he was busy with over the past few years have lingered on as he's moved to SAPS headquarters. Divisions within police in the province have emerged as a proxy for an underworld battle between factions vying for control of nightclub security and the drug trade. In an oversimplified explanation, the way this has worked is that each side appears to be in control of different groupings of police officers who abuse their positions to leverage power and influence. The full scale of this came to light in December when one of the most senior cops in this murky world, a Lieutenant Colonel Charl Kinnear, authored a 59-page complaint to SAPS management, provincial commissioners and IPID. In it, he described how there was a plot against him and his colleagues, including Western Cape detective head Major General Jeremy Vearey and Jacobs. Kinnear pointed the finger at another grouping of senior cops, ostensibly led by the man who was in charge of Crime Intelligence in the province before Jacobs, Major General Mzwandile Tiyo. He also mentions Brigadier Sanjith Hansraj and Captain Alfred Barker. In the complaint, Kinnear alleged that a rogue unit of six members had been targeting their colleagues and interfering with investigations. They allegedly attempted to interfere with investigations, illegally intercepted Kinnear's phone and requested a prisoner to make a false statement against police officers, among other claims. Jacobs has reportedly backed Kinnear, describing Tiyo and his associates as a "rogue team" and asked that the grouping be shut down. Here's where it gets interesting – Kinnear is the investigating officer in a crucial underworld extortion case against security boss Nafiz Modack. It's alleged that Modack is aligned to Barker and that his rival, Sea Point businessman and controversial figure Mark Lifman is working with Kinnear. So in essence, there are two warring factions in control of two different groups within law enforcement. Distilled, what all of this translates into is an organisation riddled with politics and internal squabbles, distracted from the real work of gathering intelligence to fight crime.